Market Monitor is a breadth based market timing system. I use it primarily to decide which market phase is favorable for my style of breakout trading and which period should be avoided. I also use the Market Monitor to time long term retirement account (401k) fund allocation. I developed Market Monitor in the beginning of 2001. The impetus for developing the market monitor was couple big draw-downs after big profits. Prior to Market Monitor I often used to run up my account a lot during bull moves , but end up giving up lot of those profits during bearish periods. In 2001 I decided to do something about it. . The process of developing Market Monitor started with an exhaustive study of commonly used market timing methods. I read every book, article, research study in public domain on market timing. I spent thousands of dollars on books and data and hundreds of hours and many sleepless nights till I found what I wanted. Everyday morning I would start work on this, experiment with hundreds of things and nothing would work. Everyday evening I would go for a long run near Princeton Lake, generate new ideas, come back and work on it till late in the night and next day the cycle would repeat. Basically for four months I had only one obsession in life, market timing. After hundreds of failed attempt I finally found a workable method. Most of the original models is intact since 2001. Over the years I have fine tuned it a bit but core logic is same. Since then I have avoided all major bearish moves successfully. Long standing members of the site who have been following this model since my public blog started will tell you how they avoided the worst bear market in history by using Market Monitor. There are several members who have built their own databases to monitor this information and many have refined and enhanced the model over the years. Once I started the blog I started publishing the figures on the blog and from that the spreadsheet evolved. Earlier I use to only look at the data daily and not maintain a running data series. When you study market timing you will soon discover that there are two camps. Those who believe market cannot be timed and those who believe market can be timed. Essence of speculation is in market timing. Speculators throw market studies and extreme development of skills have developed workable tools to time the market. Breadth analyst who study the extent of component stocks participating in a overall market move and determined market direction based on breadth trends. The Market Monitor is based on market breadth. In 2001 I used a 40 years data of market breadth and found some data patterns which indicate likely start and end of a bull move. Other people have done similar studies and have developed variety of Market Timing models based on market breadth. One of the advantage of market breadth models over other models is it uses internally developed data points from market moves to decide market direction. As against that let us say you have market timing model based on length of skirts women wear, then the data point used in external. In 2001 when I developed by Market Timing model my goal was very clear: to avoid big draw downs. I knew that I could make big money by holding on to gain. So I was looking at a overall filter which will tell me when to trade my breakout kind methods and when to sit out. That is the basic objective of Market Monitor even today. The basic logic behind Market Monitor is that breadth extremes happen at turns and moves are confirmed by breadth cross over. 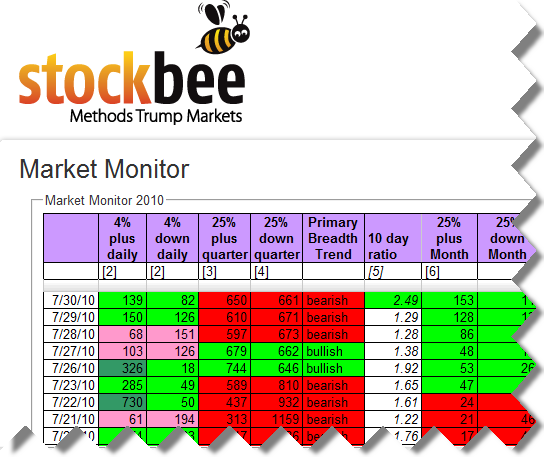 Market Monitor measures the breadth of major moves in market as against other commonly used breadth measure which tends to be noisy. Market Monitor daily measures breadth of various magnitude and duration move. Market Monitor generates two types of signals: market extremes signal and market turn signal. In a bull market at some stage the market reaches a breadth extreme as measured by Market Monitor. That indicates likely turn zone or topping zone. Similarly in bear market at some stage market reach breadth extreme. That indicates likely turn zone or bottoming zone. Such extreme signals are often early indicator and actual topping and bottoming can be delayed by few weeks to few months.Rallies which start from such extreme levels tend to be major rallies lasting 8 to 12 months and result in market going up 20% plus. Extreme turn signals on end of day basis are rare. Often a bull or bear market reaches extreme in intraday basis and reverses. The second kind of signal Market Monitor gives is confirmation signal. It is indicated by breadth cross over. Breadth cross over signal safe periods for breakout trading. Data generated from these scans is fed in to a spreadsheet and in some cases a further value is derived using simple calculations. In second part I will look at how each of the Market Monitor column is interpreted.